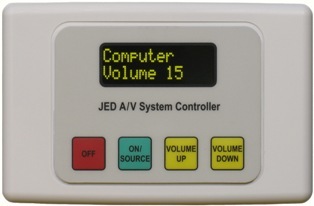 JED makes three low cost RS232 remote controller families for LCD and DLP video and data projectors, LCD and Plasma flat panels, for lecture theatres, classrooms, churches or conference rooms. 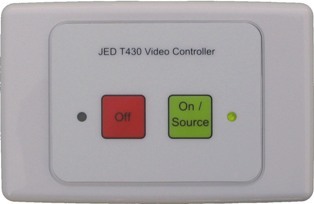 The T430 is a budget-priced wired (RS232 and limited IR) remote controller for video projectors and flat panels, allowing just simple On-Off control, and an option of a basic toggle channel/source selection. This is done with just two push-buttons, as the photo shows: just Off/On or Off/On-Source. Ease of setup and installation has been an important design criterion, and this has been achieved by providing a data-base of pre-coded projector code families in all units, so all have identical software (which is field up-dateable). At install time, or whenever options (or projectors) are changed in a room, the changes are made by selecting device families with hex switches on the back of the unit. The T440 is a lower cost RS232 remote controller for LCD and DLP video and data projectors, LCD and Plasma flat panels, for budget installations in lecture theatres, classrooms, churches or conference rooms. 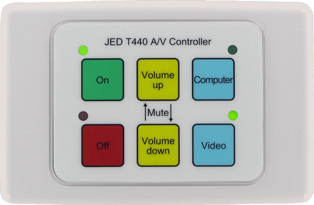 The JED T440 projector controller (and optional T441 or T461 audio controller) offers a convenient system to control video and data projectors from a suitable point on a lectern, bench or wall near a speaker's location in a hall or theatre. Alternatively, the controller and front assembly can be mounted on a black or white Clipsal 2000 base block, and can be wall mounted near the operator's position. A 45 degree white or black metal case is also available. The T440 has an attractive white, or black, smooth escutcheon surrounding it, to give an overall size of 110mm by 70mm. This covers the screw holes and can be mounted into a lectern or desk at a convenient point for the speaker to control video and data projector operations. As an option, just the adhesive backed keyboard and electronics board can be supplied without a Clipsal plate, to allow installers to mount the system on their own panel to match the decor of media control desks or wall plates in boardrooms, etc. The control codes for different projectors are programmed into the T440 controller, and the projector family needed for a particular installation is selected on the rotary switches on the back. Keyboard type and options are selected on other switches on the back. The JED T460R projector controllers offer a convenient system to control video and data projectors from a suitable point on a lectern, bench or wall near a speaker's location in a hall or theatre. The T460R is a new version of this, released September 2011, which replaces the back-lit LCD display with a self-emitting OLED display, giving much higher visibility and better viewing angles. It adds the option of four N-FET "relay" outputs which can be used to drive screen controllers, projector "dippers" and room light- dimming controls. The front panel keyboard of the T460R is shown above, is 76mm by 58mm, and is mounted on either a white or black Clipsal 2000 series blank power point base or grid plate. Behind the window is a two-line OLEDscreen showing system status. The T460R has an attractive white, or black, smooth escutcheon surrounding it to give an overall size of 110mm by 70mm. This covers the screw holes and can be mounted into a lectern or desk at a convenient point for the speaker to control video and data projector operations. Alternatively, the controller and front assembly can be mounted on a black or white Clipsal 2000 base block, and can be wall mounted near the operator's position. As an option, just the adhesive backed keyboard and electronics board can be supplied without a Clipsal plate, to allow installers to mount the system on their own panel to match the decor of media control desks or wall plates in boardrooms, etc. The T460R is wired back to the LCD projector via an RS232 data cable, needing only three wires (TX, RX and Ground). The control codes for many hundreds of projectors are programmed into the T460R controller, and a variety of customising set-ups can be performed on the unit via the front panel keys to select different projector makes and models, and then to name video sources from a menu and allocate them to various input channels on the projector. The control of audio level can be done in the projector, and audio control signals are sent to the projector along with the video source and power control signals. If a T461 audio rack is installed, it is controlled with a second serial port on the T460R, and the T461 selects and controls the audio levels in step with source select signals sent to the video projector. Optional keyboard background colours and keyboards are available. The standard key-labels for the right-hand keys are "VOLUME UP" and "VOLUME DOWN". Aiphone intercoms Nexia, Audia, Media Matrix DSP systems. Bose, EV, KV2, JBL, Tannoy, Turbosound speakers LG, Samsung Display Screens.